ACLU Pushes For Answers On Drone Strikes Drone strikes ordered by the Obama administration have killed more than a dozen al-Qaida leaders around the world. But when the ACLU asked for more information about the targeted killing, the CIA said it's a secret. Now the case is headed to federal appeals court. Drone strikes ordered by the Obama administration have killed more than a dozen al-Qaida leaders around the world, in places ranging from Afghanistan to Somalia. In speeches and public appearances, U.S. officials say those attacks are legal and essential to protect the nation's security. But when civil liberties groups asked for more information about targeted killing, the CIA told them it's a secret. On Thursday, they'll square off in front of a federal appeals court in Washington. Jameel Jaffer of the American Civil Liberties Union calls the targeted killing strategy "the centerpiece of the Obama administration's counterterrorism policies." But when Jaffer asked the CIA some questions about its use of drones two years ago, the agency said it could neither confirm nor deny it had any relevant information. So Jaffer sued for the records under the federal Freedom of Information Act. "It shouldn't be the case that with ... a program under which the administration is killing suspected terrorists without presenting evidence to any court, killing Americans without presenting evidence to any court, that the only information we have about the program is the information that the administration wants us to have," he says. Over the past few years, a half-dozen government officials — starting with President Obama — have defended the deadly strikes. "I want to make sure that people understand actually drones have not caused a huge number of civilian casualties," Obama said during a live video chat sponsored by Google+ in January. "For the most part, they have been very precise — precision strikes against al-Qaida and their affiliates." Defense Secretary Leon Panetta, the former director of the CIA, told a Los Angeles audience in May 2009: "Because these are covert and secret operations, I can't go into particulars. I think it does suffice to say that these operations have been very effective." Last year, a federal judge in Washington, D.C., sided with the intelligence community. 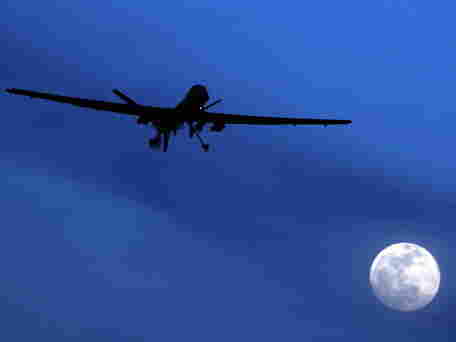 Judge Rosemary Collyer ruled that the CIA had never officially disclosed the agency's role in drone strikes. The judge wrote that making the CIA hand over materials could jeopardize sources and methods. That was the right call, says Ben Powell, former top lawyer for the Office of the Director of National Intelligence, who now practices law at the Wilmer Hale firm. "There is not ... I think what the judge referred to as a 'cat out of the bag' doctrine, meaning that the fact that officials may have generally alluded to activities or capabilities does not mean they've officially acknowledged the existence of the detailed records that the ACLU is seeking," Powell says. The ACLU appealed that decision because, Jaffer says, "it's true that in some statements they don't use the word 'CIA' and in other statements they don't use the word 'drone,' but no reasonable person could listen to these statements individually, and certainly not collectively, and come away with the impression that the CIA had done anything other than confirm the existence of a program under which the CIA uses drones to carry out targeted killing." Jaffer will argue the case for the ACLU. Stuart Delery, the acting chief of the civil division at the Justice Department, will defend the administration's position. Government lawyers didn't want to comment on the pending case. But former Rep. Jane Harman, D-Calif., told an audience at the Wilson Center this year that it can be tough to draw the lines. "The fact that the U.S. conducts targeted strikes using drones has always been something that I as a public official danced around because I knew it had not been officially acknowledged by our government," Harman said. "I was one of those members of Congress briefed on this program. I have seen the feed that shows how we do these things." Harman gave the administration credit for trying to explain the checks and balances for the drone program without saying too much about sources and methods. That's little comfort to the ACLU, which calls the Obama approach "self-serving." Jaffer points out that the Democratic Party ran a video at its political convention in Charlotte, N.C., praising Obama for killing suspected terrorist Anwar al-Awlaki — an American who died in a drone strike in Yemen last year.